1 drawing on paper, laminated : ink ; 9.5 x 6 in. 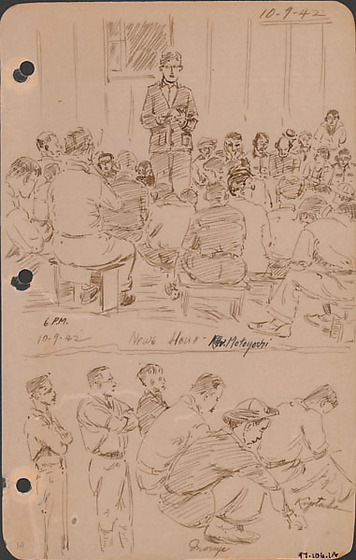 Laminated ink drawing composed of two sketches of news hour at Lordsburg Justice Department Camp, New Mexico on October 9, 1942, 6 PM. Top image depicts a group of men seated on low stools around a man in jacket standing in center ; man holds what appears to be paper in his hands as he faces the viewer ; a window is open behind him. Bottom image depicts three men standing wtih arms crossed, on left, and three men squatting with heads down, on right, two are identified as Inouye and Kiyotsuka by inscriptions. Drawing 97.106.1B on verso of same sheet.